436 pages | 16 Color Illus. | 52 B/W Illus. Despite 40 years of aggressive pharmaceutical and surgical interventions, coronary artery disease (CAD) remains the number one killer of women and men in Western civilization. When it comes to CAD, prevention is easier than cure, and if CAD does present itself, a combination of conventional and alternative methodologies can truly make a difference in people’s lives. 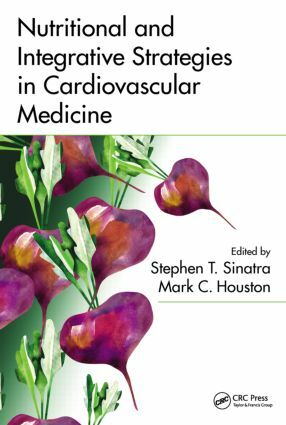 Nutritional and Integrative Strategies in Cardiovascular Medicine provides scientific and clinical insight from leaders in the field of cardiovascular medicine who explore an integrative approach to treating and curing cardiovascular diseases through conventional and non-allopathic methodologies. Nutritional medicine and understanding nutrigenomics for the prevention and treatment of cardiovascular disease will become the recommended practice of medicine in the very near future. This book is designed to help established health professionals as well as students preparing for degrees in healthcare. Dr. Stephen T. Sinatra is a board-certified cardiologist with over 40 years of experience in treating cardiovascular disease. He is an assistant clinical professor of medicine at the University of Connecticut School of Medicine in Farmington, Connecticut, and a clinical assistant professor of family medicine at the University of New England College of Osteopathic Medicine in Biddeford, Maine. Certified as a bioenergetic psychotherapist and nutrition and antiaging specialist, he integrates psychological, nutraceutical, and energy medicine/electroceutical therapies in the matrix of healing. Dr. Mark Houston is an associate clinical professor of medicine at Vanderbilt University School of Medicine, director of the Hypertension Institute and Vascular Biology, and medical director of the Division of Human Nutrition at Saint Thomas Medical Group, Saint Thomas Hospital and Health Services in Nashville, Tennessee. He is also on the faculty of A4M for the FAARM and USF, the Institute for Functional Medicine (IFM) and the Metabolic Medicine Institute (MMI) and George Washington University (GWU). He is one of the opinion leaders and faculty for Personalized Lifestyle Medicine Institute (PLMI).